A field of 156 players, including golf legends Tom Watson, Greg Norman, Gary Player, Hale Irwin, Fuzzy Zoeller, Craig Stadler, Peter Jacobsen and Raymond Floyd, as well as relative newcomers to the Senior Tour Nick Price, Mark O-Meara and crowd favorite Fred Fink, challenge the Kiawah Island Golf Resort-s Ocean Course each year in pursuit of the coveted Alfred S. Bourne Trophy and a share of a $2 million purse. Network television coverage of the Senior PGA Championship, played May 24 through May 27 in 2007, highlights golf-s legends competing against the tranquil background created by one of the world-s most imaginative and environment-friendly golf courses. "We are very proud to host such a prestigious tournament as the Senior PGA Championship," says Roger Warren, president of Kiawah Island Golf Resort and the PGA of America. "This tournament always creates positive exposure for Kiawah, the Charleston area and the state of South Carolina, and the Ocean Course tests some of the world-s greatest players." Designed by Pete Dye, the Ocean Course has a distinguished history, highlighted by "The War by the Shore," the 1991 Ryder Cup event that was decided by the final putt on the final hole at the end of the final day of competition. The 1997 World Cup of Golf followed, as did the 2001 UBS Warburg Cup, the 2003 World Golf Championship and the 2005 PGA Club Pro Championship. The legend of the Ocean Course is certain to grow when it hosts the 2012 PGA Championship. The appropriately-named Ocean Course, located at the end of Kiawah Island, offers panoramic views of the Atlantic. The course has been recognized by golf professionals for its difficulty and by the Audubon Sanctuary System as a Certified Audubon Cooperative Sanctuary. It also joined Robert Redford, Matt Damon, Will Smith and Charlize Theron as a star of the movie "The Legend of Bagger Vance," which opened in theaters in November 2000.
the opportunity to snap photos and seek autographs. Tickets purchased in advance were discounted by as much as 50 percent, and, because the PGA of America is encouraging young people to learn about golf, youngsters up to the age of 17 were admitted free when accompanied by a paying adult. Coolbaugh points out that because parking and a shuttle service were free, families of four enjoyed world-class golf for as little as $20. "Golf teaches tremendous values and we at the PGA want children to learn about the world of golf and maybe pursue a future in golf," Coolbaugh says. With the tournament being held during Memorial Day weekend, the PGA also offered two tickets for the price of one to active and retired military personnel. An additional upside to attending the Senior PGA Championship is that those who bought tickets to the event will have first shot at tickets for the 2012 PGA Championship at Kiawah. 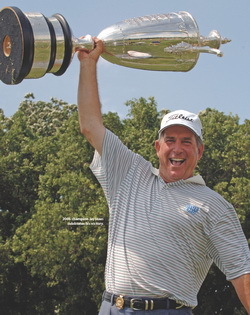 Are you interested in how the 2007 Senior PGA Tournament turned out? For tournament results, visit www.johnsislandliving.com. For more information on the Kiawah Island Golf Resort or the Ocean Course, call (800) 876-1570 or log on to www.KiawahResort.com.